My favorite time of day to have chocolate is for breakfast. I think it's because my taste buds are fresh. Whatever the reason, it really sets a happy tone for my day. What can possibly go wrong when you have chocolate for breakfast? One of my favorite ways to have chocolate for breakfast is to make this cocoa-banana quinoa. Topped with some fresh berries and walnuts, it's totally amazing. The best part is, it's actually super healthy! Seriously, this is some chocolate-y goodness that you should really eat more often. Quinoa is a great source of complex carbohydrates and protein to give you fuel and energy for your morning, along with lots of other nutrients (especially folate, magnesium, phosphorus and manganese). Cinnamon adds some yummy flavor, but did you know that it also gives you a huge boost of cancer-fighting antioxidants? Plus, it helps stimulate your digestive system so that you digest and absorb all the nutrients from your amazing breakfast. Even the chocolate itself is healthy! Cocoa (or carob, if you prefer) powder is a great way to add more antioxidants and some minerals, like magnesium and iron. Mixing it with banana makes it sweet and creamy without any added sugar or bad fats. Topping your bowl off with fresh berries takes the antioxidant level of breakfast even further, and also brings in some vitamin C, which helps your body get the most out of that plant-based iron. 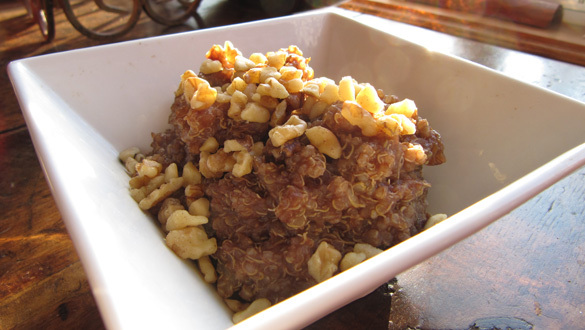 Walnuts and flax (or chia) seeds add some healthy fat, including a nice boost of omega-3. Healthy fats are necessary not only for your body to function properly, but also to absorb certain vitamins and minerals. It also helps you stay full and satisfied until lunch. With all of that healthiness going on, there's absolutely nothing you can feel guilty about. All you need to do is dig in and get your chocolate fix! And if you're not into chocolate for breakfast, this recipe also makes a fantastic dessert. In a pot, combine the quinoa, cinnamon, non-dairy milk and 1 cup of water. Bring this to a boil, and then turn it down to low, and simmer for 20-30 minutes. *Note: since there's more liquid than normal, it will take a bit longer than usual. Stir the quinoa occasionally, so that it creates a porridge-like texture. After about 15 minutes, stir in the raisins so that they absorb some liquid and get large and plump. While the quinoa cooks, mash or puree the banana with the cocoa (or carob) powder and flax/chia seeds. If you puree, you'll need to add about two tablespoons of water or non-dairy milk to get things going. Once the quinoa is cooked, stir in the cocoa-banana mixture and serve. Or you can serve and then drizzle with the cocoa-banana mixture. Top it off with the walnuts and fresh raspberries or strawberries. Heather is a Registered Holistic Nutritionist, showing you how to have fun while making simple, fast, incredibly delicious and healthy vegan recipes that leave you and your family satisfied and full of energy. She specializes in helping people get to an optimal level of health by getting them on a nutritionally-complete healthy eating plan, and supporting them to guarantee they achieve their nutrition goals at HealthyEatingStartsHere.com.